Art gives you energy, different perspectives and inspiration. For some years now, I have been employing text in a number of my works and series. The recent works have something to do with stars, the Milky Way and deserts. To see a couple of works, please visit my previous post or the album of [Printmaking/ Intaglio2] on Facebook Page. In those pieces, the text is very subtle and in an abstract way. Yet, there is meaning. 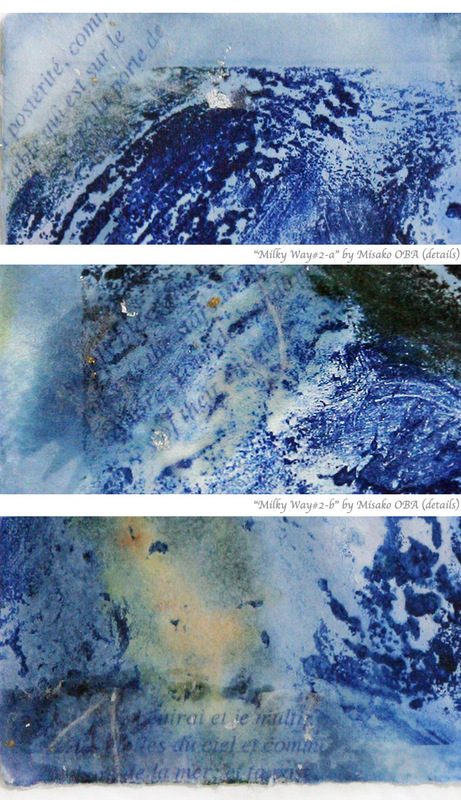 “Milky Way #2” (details). 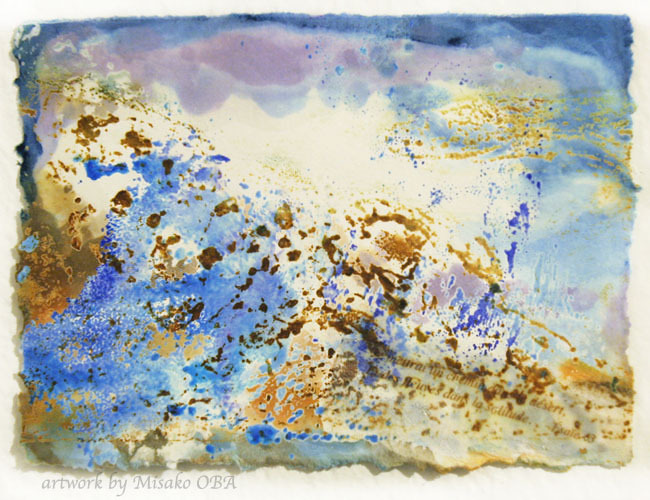 Collagraph with carborundum and beeswax (mixed media), Misako Oba. 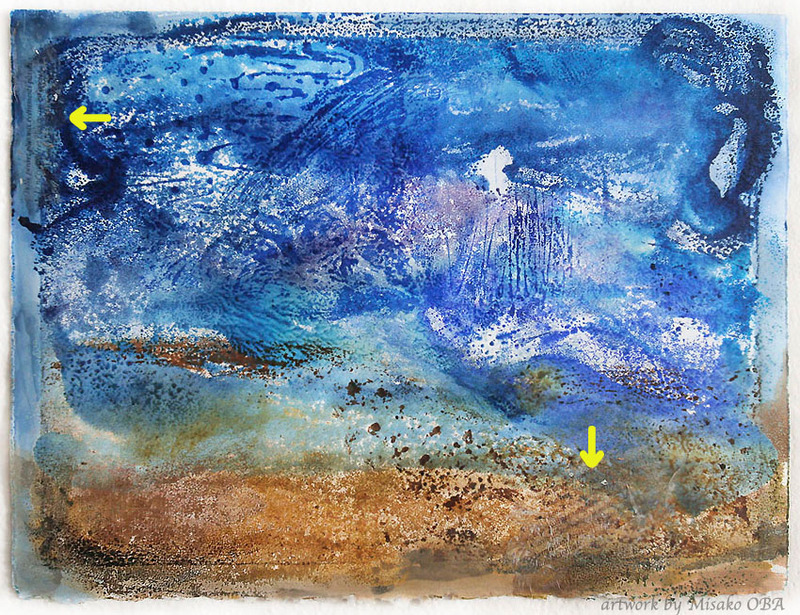 * The whole piece “Milky Way #2 (diptych)” can be viewed in Drawn to Stars, Behind the Scene. (Mixed media), unique, Misako Oba. The text is in lower right corner. * The whole piece of #4 can be viewed in here. Et ne considérez plus ce qui est ancien. sur le point d’arriver: Ne la connaîtrez-vous pas? now it springs forth, do you not perceive it? When I was thinking if I should move from New York to Seattle, this verse (Isaiah 43:18, 19) came up to me three times within a week. One of my friends referred it directly to me. The phrase even happened to show up in my Newsfeed on Facebook. And, more… It was a mysterious, spiritual and amazing experience. And in fact, there were “rivers” and a “way” that were prepared for me before my move. I feel grateful. Things are very different in the Pacific Northwest from New York City, or even just the East Coast. People, culture, customs, weather, nature…and more. I feel creative inspiration a little more when I am in an unfamiliar environment. You can find the inspiration in daily life, though. Having easier access to nature became a part of my daily life. 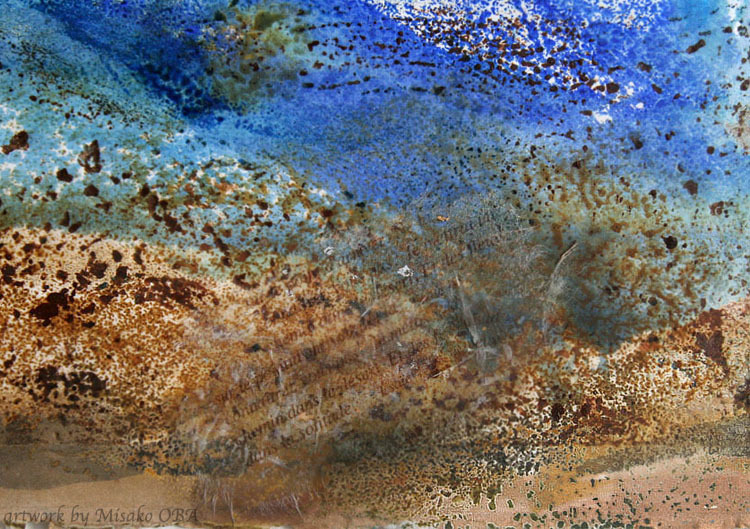 It is coming along as the series of mixed media and intaglio – such as the work of stars and desert. Recently, I noticed that Marc Chagall (1887-1985) also did the printmaking (Etchings and Lithographs) based on the Bible. He worked on the series of etchings over a 25 year period. Marc Chagall © ARS, NY, Joseph Interprets Pharaoh’s Dreams, 1957, The Bible, no. 22. Hand-colored etching, The Patrick and Beatrice Haggerty Museum of Art, Marquette University, Milwaukee. I cannot compare myself with Chagall. He is a great master in art history and he illustrated the Bible. You can find more of his works and bio here as well. I visualize, think over the meaning, research, apply, synchronize my emotion/experience and then create the image in a semi-abstract form. I am grateful that I came across the idea that is somehow connected to what he did in his work. He is one of my favorite artists. And I am also thankful that our approach is different. I was born and raised in Japan, but lived and spent many years in Western culture as well. So, my thoughts, culture background, and philosophy have become very complex. 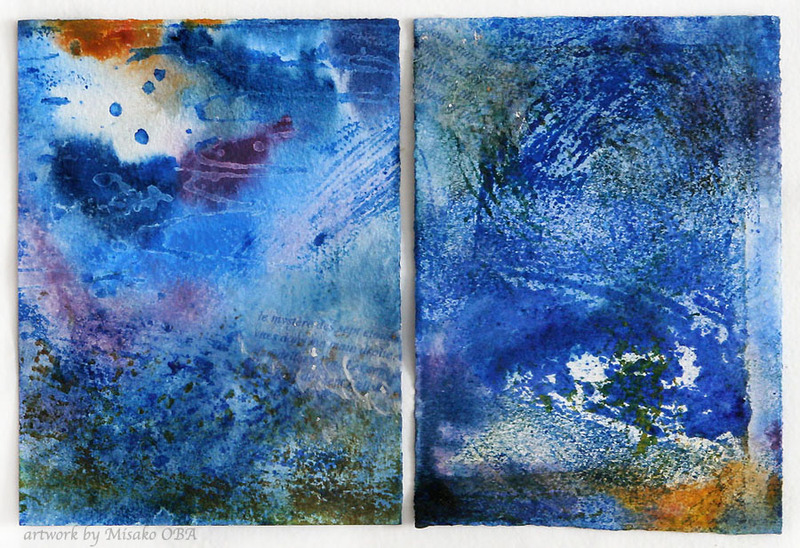 In my encaustic mixed media series, Truth in Emotion “Beyond Time and Space,” I am incorporating Hyakunin Isshu (百人一首), the collection of 100 Japanese ancient poems called Waka. The text is from 7-11th Century in Japan, and calligraphy in Eastern culture. In my other mixed media series and Intaglio I am incorporating verses from the Bible, that is originally under Western influence. Both are relating human conditions and emotion through life that we can be connected to even in the modern society. Life is a journey. That is the body of my artwork that I have been pursuing. *The Advertisements you may see below or on this page are not associated with the post. 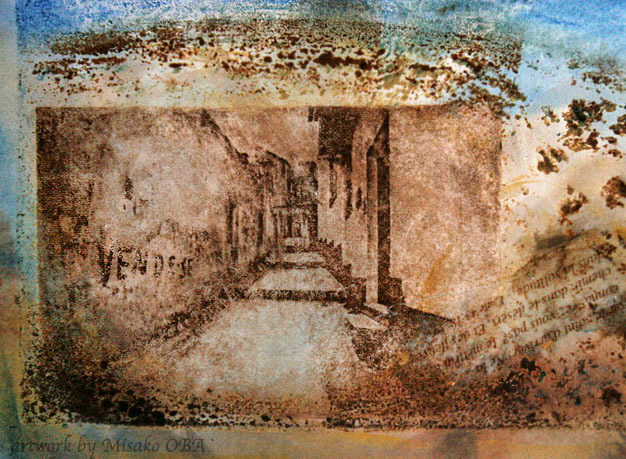 This entry was posted in Creative process, Encaustic, Printmaking/Intaglio, Quotes and tagged art, beeswax, Beyond Time and Space, Bible, carborundum, Collagraph, 百人一首, desert, encaustic, encaustic paint, Hyakunin Isshu, intaglio, Isaiah, Marc Chagall, Milky Way, mixed media, monotype, New York, poem, printmaking, scriptures, Seattle, stars, text, wax. Bookmark the permalink. Beautiful art and words Misako. Thank you for your comments! Very encouraging and makes me keep on going/creating. Thanks! I have been developing more work in the same series. With new idea of text. It will take more time to complete.